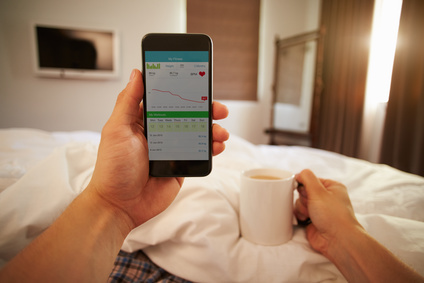 A cellphone app and a sleep monitoring sensor could be a solution for chronic insomnia and sleep disorders. Some 70 million Americans have difficulty sleeping every night. Older men and women are more likely to experience insomnia and sleep disturbances, but children and teens are affected too. There are approximately 90 different sleep disorders. Some relate to the nervous system and unexpected movements, such as sleepwalking and parasomnias. Other conditions like obstructive sleep apnea affect breathing and interrupt the sleep cycles. Insomnia is the elephant in the bedroom. It affects approximately 10 percent of adults. However, the single biggest problem is simply not getting enough sleep. One-third of Americans get by with less than seven hours of rest each night. After decades of research on sleep monitoring, we now know that limited amounts of shuteye cause many physiological and psychological problems that go well beyond daytime drowsiness. To enjoy the health benefits of sleep, you should rest for seven or eight hours each night. Currently, there are no formal guidelines for treating insomnia and sleep disorders. In-lab polysomnography is costly and uncomfortable, and sleeping pills have many side effects. Although there's a need for better diagnostic protocols and treatment methods, there are a few resources that you can use at home. For example, personal sleep monitors offer a convenient way to get more sleep and to improve the quality of your rest. The long-term benefits of these behavioral sleep monitoring techniques have been proven in numerous studies. Thanks to advances in technology, many sleep monitoring systems can be used at home. These devices are affordable and accessible. Because they are used night after night, they are more effective in the long run. In the past few years, personal fitness devices and sleep monitors have become very popular. Some activity monitors track your rest by sensing movement. Any tossing and turning decreases the duration and estimated quality of your sleep. Other sleep monitoring systems track your heart rate and level of relaxation with great accuracy. One night in a sleep monitoring lab costs between $500 and $2,000, and the study may or may not be covered by your insurance even if you get a preauthorization. Frequently, the results only tell you what you already know. Even worse, in-lab sleep monitoring doesn't offer the long-term management that patients really need. On the other hand, personal sleep monitoring sensors cost about $100 or $200, and they do provide guidance for managing sleep and nighttime habits. Most sleep monitoring products have two components. You need a Bluetooth-compatible heart rate monitor and a sleep monitoring app that analyzes the data and provides personalized recommendations. Depending on the type of sensor, the device can also track your performance during workouts. A sleep monitoring app like SleepRate can be used by itself, but the results won't be as detailed. This free application maintains a sleep diary and automatically records nighttime noises to determine if snoring or environmental influences are disrupting your sleep. The main advantage of sleep monitoring systems is that they use biofeedback and behavioral techniques. Behavioral sleep management techniques have a remarkable rate of success. A meta analysis of 48 clinical trials found that behavioral approaches to sleep management continued to help 75 percent of patients six months after the studies ended. The most effective treatment methods include relaxation techniques, cognitive behavioral therapy, mild sleep restriction and lifestyle changes. They relieve stress and reduce negative thoughts and feelings that prevent restful sleep. Insomnia and sleep disorders are linked to a long list of health problems and premature death. Sleep assists the cardiovascular, nervous, endocrine and immune systems. While the body is resting, the cells are repaired. The brain has a chance to process the chemicals that regulate mood, behavior and concentration. Increasing your sleep to the recommended seven or eight hours can protect you from these chronic health issues. Low-quality sleep causes many interrelated health problems, but the solution is clear. Studies show that you can't make up for lost hours of rest by sleeping longer on weekends, but you can increase the quality and duration of your sleep by using a sleep monitoring system and other resources. This can improve your overall health and reduce stress so that you sleep better at night and accomplish more during the day.